Barbara Rudolph Fine Art: Gambel's Quail painting "The Gambling Quail"
Gambel's Quail painting "The Gambling Quail"
We have so many "gambel's quail" running around in Arizona. They are so fun to watch. 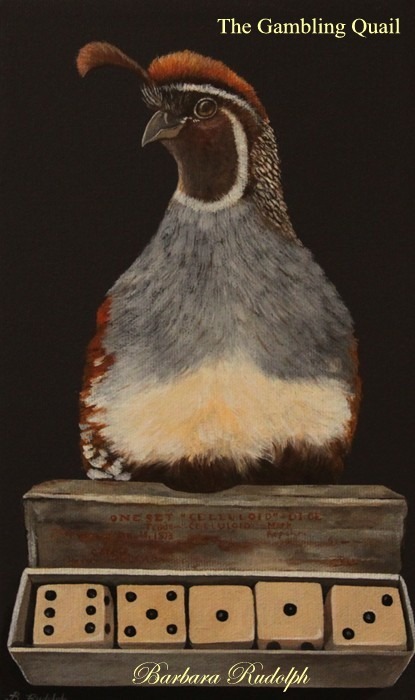 I thought this would make a fun painting, so I painted a male "gambel's quail" as if he is getting ready to roll the dice. He is in charge and ready for action. This new oil painting is 10x6x2.5" painted on gallery wrapped canvas. It will be for sale at the opening of the "Celebration of Fine Art" in Scottsdale. It opens on Saturday. See links for more details.